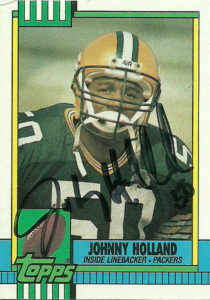 Johnny Holland was one of the galvanizing forces behind the ‘Wrecking Crew’ of the Texas A&M defense during the dying days of the Southwest Conference of the mid to late 80s. At the time of his graduation from A&M he was the school’s all-time leading tackler and garnered Johnny the nickname ‘Mr. Everywhere’. In 1987, the Green Bay Packers selected Johnny with their second round pick of the draft. 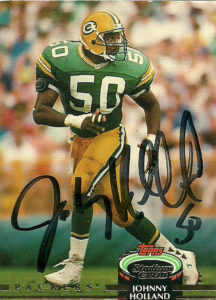 The ’87 draft has an impressive pedigree of linebacker talent that included: Cornelius Bennett, Shane Conlan, Brian Bosworth (SUP), Dave Wyman, Winston Moss, Michael Brooks, Scott Stephen, Byron Evans, Hardy Nickerson, Al Smith, Dennis Gibson, Greg Lloyd, and Jessie Tuggle (UDFA). Johnny fit right in, and the Packers were glad to have him, as he’d earn team rookie of the year honors from the franchise. Johnny was a smart, instinctual, consistent, and reliable force for the Packers over the next 6 seasons- prized traits for linebackers. 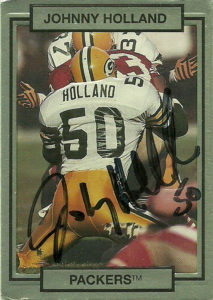 Although not flashy, Holland could be counted on by the Pack to post 100+ tackle seasons with regularity. During the 1992 season he herniated a disc in his neck. 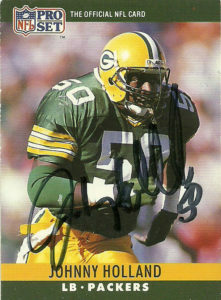 He rehabbed from the injury and returned to form in 1993 recording a career high 145 tackles, but learned that he had blown a disc in his back during the season. Johnny opted to retire. He jumped almost right into coaching from there in 1995, first with the Packers until 1999. Holland served in a variety of capacities from Special Teams to Linebackers to quality control. He then spent the next 3 seasons with the Seahawks as an assistant conditioning coach, special teams, and linebackers coach. From 2003 to 2005 Johnny was an assistant defensive coach and Linebackers coach with the Lions before his longest stint with the Houston Texans (2006-2010) as their linebackers coach. He’d coach for the Virginia Destroyers of the UFL in 2011, and then after serving 1 season as the LB coach of the Oakland Raiders (2012), Johnny took a dip in the pool of the CFL with the British Columbia Lions LB corps (2014-2015). He coached the ILB crew of the Browns for 2016, and as of 2017 is with the 49ers in a similar capacity. Beloved by the Packers’ faithful, Johnny was inducted into the franchise’s Hall of Fame in 2001. He also has been honored by both Texas A&M (1993) and the Cotton Bowl (2000) for his contributions to the sport. Johnny is a very good signer through the mail. He signed these 4 cards for me via the Browns back in 2016. Johnny’s Proset 1990 card is a beast and his Stadium Club entry does not disappoint either. The other two entries are kinda bad. Action Packed gives an entry of him from behind. That’s not what you want to see, however I selected it because I got so many duplicates of this card when I used to get them at the 7-11 I might as well get it signed too. Topps 1990 suffered from a lot of bad things. Bad design and lazy photography riddled the set. Still it was a foundation of my set collecting of my childhood and sometimes the portrait photos of the players just stick with me, like this one of Johnny.